Here's the first of a two-part guest post from Dr. Tony McGroarty, a sports psychologist with whom I play basketball. In these articles, Tony discusses motivation and how it impacts the performance and development of young soccer players. Although the article is directed at the soccer community, his ideas apply equally to all sports. Tony's philosophy mirrors many of the principles I advocate in my writings, but he goes into much greater detail and brings a professional psychologist's perspective. Thought, emotion, and movement are woven together to create the performance you see on the soccer field. You, athletes and coaches, love what you do! Right? I hope so. You work hard in practice and in competition year after year, persevering with a sense of joy. This, of course, is the ideal situation. It is ideal; but it is not unrealistic to expect a good dose of joy along the way as you accomplish the goals you set for yourself. It keeps you going, no matter what the pursuit. You feel motivated! Others say you are a motivated coach and soccer player. What is motivation and how can the player and coach make it happen? Some things in soccer are clear because they can be measured: your time in the 40, the score of the game, goals per game average. Other aspects of the game are not so easily understood: shifts in momentum during the game, the appearance and disappearance of a slump, the experience of being in the zone. Motivation is likewise a perplexing concept. Because it takes place within the individual player or team member, it cannot be seen nor easily measured. When the goalkeeper spends time after practice on footwork, when the defender doggedly marks a forward for a full eighty minutes, when the two captains run and lift weights during the off season, we say those players are motivated. However, what we observe in the players' actions at practice, during games, and in the off season is not motivation. It is the end result of motivation which really is psychological activity occurring within the soccer player. Motivation takes place within the individual. What is it that occurs within a soccer player that constitutes motivation? Thoughts and emotions are the two psychological activities continually at work within each of us as we go through the day. Motivation is a particular form of thinking and feeling about something we want to do. Young children rely on adults to teach them how to think clearly and how to understand and properly express their feelings. 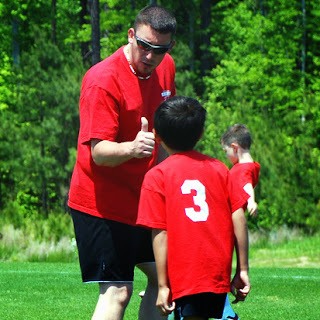 Much of the motivation to play soccer, especially for micro through U-8, comes from the external world of important adults such as parents and coaches. As children get older, the source of their motivation to play gradually becomes more internal. But, throughout childhood and adolescence there is always a mix of internal and external influences on motivation. Even the youngest athlete is internally motivated to some degree and older players still require external sources of support to maintain their motivation. Young children characteristically are motivated by external forces. External motivation refers to the situation where the player decides to play or to continue playing because of the influence of others or because they expect rewards or punishments. From the viewpoint of the child, the influence can either be positive or negative. Here are some examples of positive external motivation: the child plays soccer to please the parent, to wear a "cool" uniform, or to be thought of by friends as part of the in-group. These types of reasons for playing produce the joy of anticipation before the game and feelings of pride when others show enjoyment from the sideline. All forms of external motivation are not accompanied by such pleasurable feelings. Negative external influences also act to motivate the athlete. An example of a negative external influence is when the child keeps playing during the season because of fear. The player may fear that a parent would be angry and resort to punishment if the child did not finish out the season. The child might be afraid to lose friends for not joining the team. Sometimes, the child who is motivated at first by a negative force such as fear may actually learn to enjoy playing soccer and become influenced by the more positive sources of motivation. As the child grows motivation matures. During the middle school years the U-12 through U-14 soccer player begins to show signs of genuine internal motivation to play the game. It's great benefit to the player is that there is less need to depend on outside influences to keep playing Internal motivation cannot begin to arrive on the scene until the child can think analytically and have control over emotions. On the middle school soccer team we often see fluctuations in the balance between external and internal motivation. One day the player is excited about practice or makes plans to go jogging. Another day this same child would rather play a video game or hang out with friends than go to practice or even play in a game. Changes take place within the middle school player which support the internalization of motivation. They can think more abstractly. Abstract thinking ushers in the possibility of making a more realistic evaluation of themselves and others. Coaches and parents now begin to see the appearance of true competitiveness and authentic feelings of soccer competence. Self doubt may appear for the first time as a consequence of the young player's making a realistic appraisal of skills and finding areas of weakness. The U-13 players who understand their emotions better can, for example, use aggression appropriately without losing control and seeing constructive aggression turn to undermining anger. However, kids at this age still get too angry at themselves and others during practices and games. One can expect the high school player to have methods for motivation in place. Internal motivation requires higher-level thinking for players to put setbacks into perspective and for working toward a goal far into the future. In order to counteract feelings such as boredom, frustration and discouragement experienced during the demands of a long season, the high school player will intentionally think about winning the state championship game to generate happy feelings connected to the win. But just because internal motivation predominates, it does not mean that the high school player is ready to go it alone. Although players U-14 and older can gradually make better evaluations of the performances of self and others and set realistic goals for improvement, they still need the support of others. In fact, the truly internally motivated player knows when help is needed and how to find it. The key difference between the athlete who becomes internally motivated and the one who remains dependent on motivation from without is that the player who is internally motivated is less vulnerable to the inevitable setbacks and obstacles encountered by those who put themselves on the line and strive for excellence. Internal motivation develops when the athlete and coach plan strategies for improvement and find a network of people who provide support. Athletes still playing at the high school level have developed psychological skills which strengthen internal motivation through self-regulation of their thoughts and emotions. For instance, they can change doubt to hope by transforming thinking from negative to positive. They can control competition anxiety through the use of routines and self-relaxation methods. High school athletes look to their coaches for skill and tactical training and, just as importantly, coaches become a source for rebuilding the internal motivation which can be seriously challenged by the physical and psychological demands of playing at a high level. Next Week: The Players Speak and The Coaches Respond! The first thing is that nobody’s perfect! Performing to the best of your ability and challenging yourself each time is tough. The results are often not seen until months or even years of training have taken place. It can be difficult for anyone to stay motivated in the long-term, particularly if they are training solo and have nobody to make them accountable. That’s just one example of when motivating coaches and Sports Inspirational Speakers can step in.Motivation is an essential part of sports performance. Self-motivation and extrinsic motivation combined together form the best kind of motivation and encourage goal setting and working hard to reach that goal.